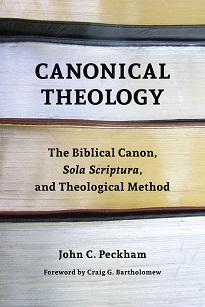 In Canonical Theology, John Peckham brings together a discussion of the biblical canon, the authority of Scripture, and the nature of theological method. The prevailing question that guides Peckham’s study relates to the locus of authority. Does it reside with the canon or with the community? This guiding question allows Peckham to navigate the variegated waters of scholarship on the nature of the biblical canon and the relevant debates about theological method. After establishing this framework (chapter one), Peckham defines an “intrinsic canon” model (chapter two), and then seeks to demonstrate its superiority to a “community approach” to the nature of the biblical canon (chapter three). The intrinsic canon approach argues that the books of Scripture are authoritative by virtue of “the intrinsic nature of the books as divinely commissioned” (5). In other words, “divinely appointed books are intrinsically canonical independent of extrinsic recognition” (5). Conversely, the community canon model “defines the canon as a set of writings that are determined by the community as a standard” (3). The biblical books, in other words, are chosen based on some sort of external standard. For Peckham, the issue that plagues the community model is its inability to answer with clarity the question, “Which community (at which time) is adequate to determine the canon?” (48, 72). Moving from biblical/historical studies to theological method, Peckham next surveys communitarian approaches to theology (chapter four), and then discusses the way various groups appropriate the rule of faith (chapter five). Using the categories of the previous canon discussion, Peckham states that a canonical approach to theology “views the biblical canon as the uniquely authoritative, sufficient source of theological doctrine, adopts the biblical canon as the rule of faith, and denies the positing of any normative extracanonical interpretive authority” (73). Conversely, various communitarian approaches “posit the primacy of the biblical canon while emphasizing the theological authority of the community and adopting a community-determined extracanonical rule of faith or other normative interpreter for theological doctrine” (74). Having established the community versus canon framework in both canon studies and theological method, Peckham homes in on the authority of Scripture (chapter six). Is an affirmation of the Scriptures as the final authority (sola scriptura) absurd or self-referentially incoherent? Peckham maintains that critiques coming from communitarian approaches to the canon and theology are not capable of overturning the coherence of this position. Further, for Peckham, an “intrinsic canon” model adequately meets the most significant criteria for coherence. To illustrate his approach, Peckham addresses recent debates about the nature of the Trinity (chapter seven), the issue of theophatic language in Scripture (chapters eight and nine), and the nature of divine love (chapter ten). A question that lingers around studies of canon involves the movement from theory to practice. What does a canonical approach look like? In his final chapters, Peckham outlines some parameters to a “canonical systematic” approach to the theological task. As he explains, a canonical systematic approach “looks for the patterns and inner logic of the texts in relation to the whole canonical text, rejecting any dichotomy between limited pericope and broad overarching reading, embracing both in mutual reciprocity such that ‘system’ is not sought at the expense of the particular complexity and variety of individual texts” (206). A canonical theological method would seek “the maximum achievable correspondence to the text” (210). Significantly, as well, this approach also “accepts hermeneutical diversity as an unavoidable result of the universal hermeneutical circle” (258). Possible “steps” that a reader would take in this approach include identifying the prevailing issues or questions on a certain topic, engaging an inductive reading of the entire canon, and then analyzing the canonical data with an eye towards any emerging patterns. Next, a theologian would seek to construct a “minimal model” from this data, systematize the “minimal theo-ontological implications,” and then maintain an openness to further investigation (see 246-57). This type of methodological procedure is designed to prioritize the idiom of biblical texts and produce modest theological formulations. One particularly instructive feature of Peckham’s study is the way he draws together canon studies and theological method discussions of the nature and application of sola scriptura. Highlighting the role of canon and community within a spectrum of approaches yields significant insight into the nature of debates about the canon and also the authority of Scripture. Peckham engages theoretical discussions but also tests his methodological conclusions on several case studies. Moving from the beginning to the end of Peckham’s volume forces you to traverse the terrain of these disciplines. Someone drawn to the “canonical” aspect of Peckham’s study might be surprised to encounter a series of distinctions more at home in systematic theology (e.g. the nature of microhermeneutical and macrophenomenological exegesis, 212; or, transcendent-voluntarist and immanent-experientialist models of divine love, 247). Conversely, someone interested primarily in theological method and systematic theology will likely be surprised by the lengthy initial historical and textual discussion of the canon debate. However, this initial disjunctive actually represents one of the deeper strengths of the book. Peckham takes these broad disciplinary issues and renders them dialogue partners. In this regard, he not only juxtaposes these concerns but demonstrates the depth of their connection. For instance, the way Peckham navigates the canon debate in broad categories of “communitarian” and “intrinsic” models provides a natural transition to communitarian or “sola scriptura” brands of theological method. Readers who have only dug deep into one of these areas will benefit from Peckham’s articulation of their organic interconnection. Moreover, the methodological clarity Peckham provides in each of the areas he covers makes this volume a top-notch resource for careful thinking about both the canon and theological method.